Once a year, violet clouds appear and bring with them disaster. For Shu’s hometown Talta, they bring the yearly land sharks. Shu’s friend Kluke lost her parents to the land sharks and together with Jiro these three kids are trying to take it down for good, so the people of Talta don’t have to be afraid anymore. They get dragged away by the land shark and this will lead them to find Nene, the evil mastermind behind the land sharks. And other evil doings, being cast aside by Nene, a mysterious voice tells them to swallow the light spheres that has appeared before them. It will grant them magic, to fight against Nene. After a small hesitation they swallow the light spheres and their shadows transform. They gain the form of mystical animal, apparently having a shadow like this is proof that you can use magic. Now with power, they can right the wrongs Nene has done in the world. This is a pretty simplified/short down version of how the game starts, I don’t want to give it all away and to explain everything as it exactly goes down would take an eternity. The battles are pretty standard JRPG, turned based just like Final Fantasy. And speaking of FF, this was one of the reasons I wanted to play this game. Since its made by the father of the Final Fantasy series, Hironobu Sakeguchi. With Nobuo Uematsu doing the music and doing one hell of a job with that! I’m probably one of the few who actually really like the boss song “Eternity” I really feel like this game game is a spiritual successor to the Playstation 1, Final Fantasy games. With a more cartoony style of course. And ‘m looking forward to trying their other game Lost Odyssey, which seems to be even more inline with being a spiritual successor to the FF games. I really enjoyed this game, it’s been a long time since I played a classic JRPG. And one that was good and enjoyable! 2012 is of too a good start when it comes to games so far and I’m currently going through my old save file of Tales of Vesperia, which I think I’m near of nearing the end of the game. Well, there where a few stuff I liked in the Blue Dragon anime more than, I liked in the game. In the anime, the shadows all have personalities and are “alive” so to say. While in they game, they are just a form/symbol for magic users. I might go deeper into the differences of the anime and game later, or just post what I liked and disliked about them. I was expecting them to be the same, but boy I was wrong. Its just about the characters and the shadows that are somewhat the same, the story is way different in the anime. Well, as I said I might go deeper into that in a later post. 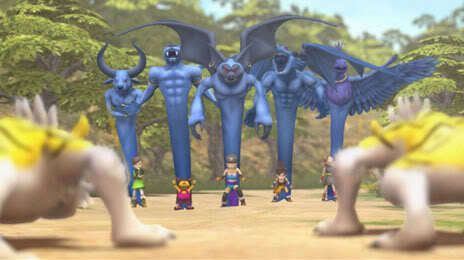 If you have an Xbox 360 and want to play an good old JRPG on a modern console, I can highly recommend Blue Dragon. Blue Dragon is great and Lost Odyssey is the best RPG released since FFXII and X and Tales of Symphonia in my book. And yeah that part of the lyric is awesome. I also love the last boss song, The Seal is broken. It was wonderful! Uematsu is king. Yup I sure do ;) and yes the “dethroy” song beats the crap out of One Winged Angel for sure! OWA is so hyped and almost nobody knows about Blue Dragons music, sad. Yeah, I agree with you 100%. I wish more people knew about Blue Dragons music.